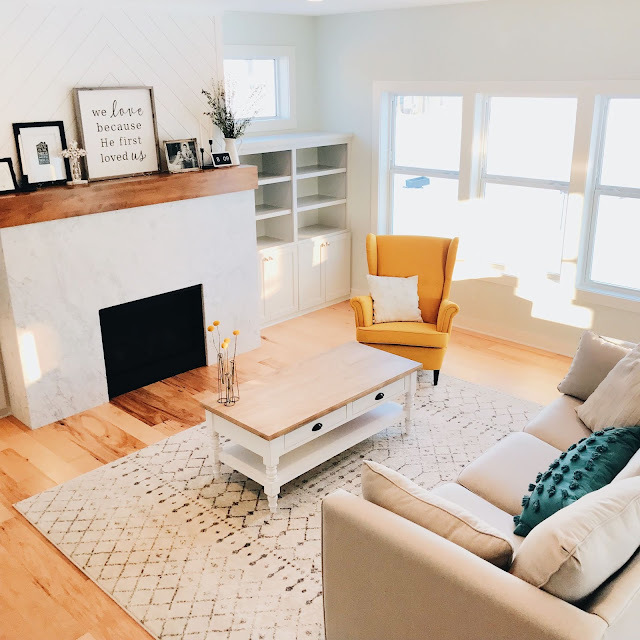 One of my favorite posts each month on my blog are the Love List posts, where I am able to share all the items we are finding, using and loving in our home and family. 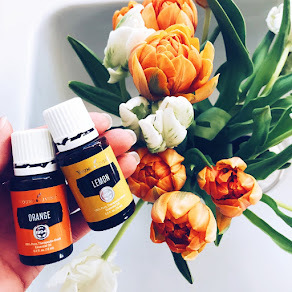 For April I wanted to share a handful of my favorite items for Spring as well as a few things that have made life as a Mom of 3 much easier! 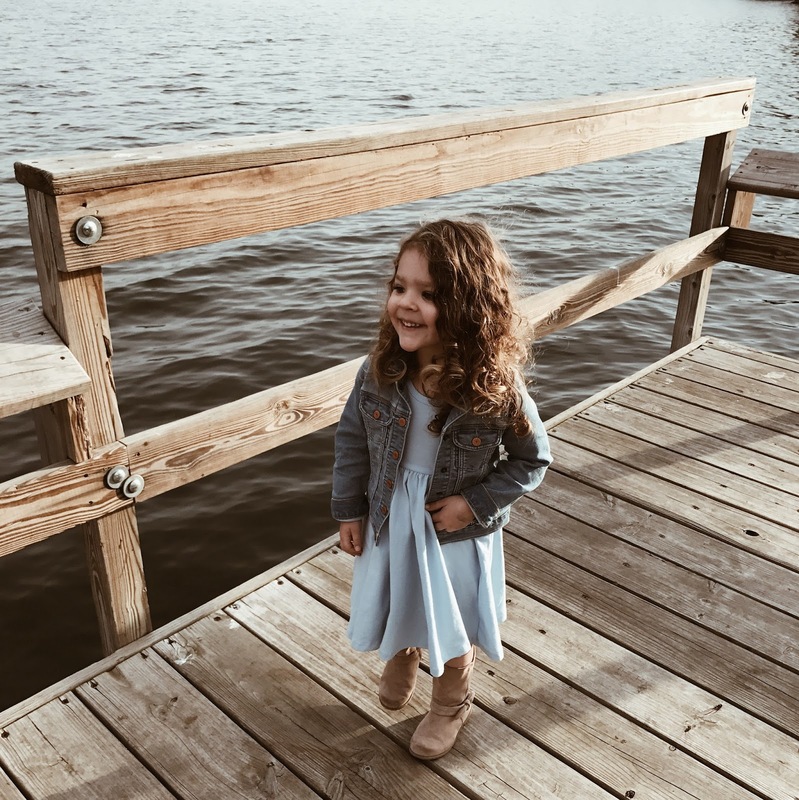 one | Ever since I can remember I dreamed of having a little girl to put a jean jacket on over a dress. Who knows where that came from, but there is just something so sweet about this combo and it has been Olivia's go-to outfit lately as we transition into Spring. We have this supersoft knit denim jacket and love pairing it with our favorite Alice & Ames dresses. 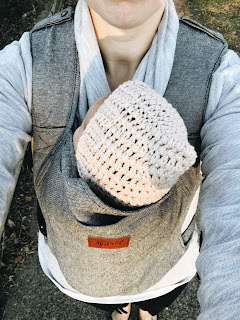 two | I recently discovered Happy Baby and am absolutely obsessed with their luxury linen baby carriers. They are so soft, incredibly easy to put on and take off and most importantly for me, so comfortable to wear. Their carriers are soft-structured, meaning they give you the support you need to carry your baby or child (which often lacks in wrap carriers) without the bulkiness of larger or hard-structured carriers. They are lightweight and breathable, which I love, making them comfortable to wear even during warmer weather and because they aren't bulky, they are perfect to throw in a diaper bag. I also love that they can be used for newborns up to children weighing 45 lbs, with no newborn insert needed. Since our Happy Baby Linen Carrier came in the mail a few weeks ago, I'm pretty sure I have used it every single day with Adaline. Happy Baby just released their gorgeous Spring line, of which my favorites are the Agave carrier and Pewter Dot. We have the Charcoal linen carrier, which I love because it's gender neutral and well, gray is my favorite color in everything! Enter BLESSEDNEST at checkout for 10% off your purchase from Happy Baby now through the end of April. This code can be applied to all carriers, including those on backorder which will be shipping in a few weeks! three | If you saw my instastory last week, I did a book tour of all our children's books and also created a series here on the blog as well as on instagram called Lit List, where I share all my favorites. For an A-Z list of all the ones we love, check out this post. We recently took a trip to our local bookstore with the girls and picked up this book and this book and haven't stopped reading them to the girls since. four | I have been on the hunt for high quality, modern water bottles for the girls that aren't covered top to bottom in Disney characters or puppies. I came across the Ello brand at Target a few weeks ago and got two for each of the girls, one each for their water and one each for their Dynamic Greens juice. I love the soft straw, easy to open lid (even for Penelope who is 19 months) and the fact that there is even a lid lock you can slide to prevent it from being opened -- perfect for when they are in my diaper bag or we are in the car. If you are ordering them online, be sure to get the ones with the triangle pattern (versus the square), because those are the ones with straws. The square pattern is more of an open spout (no straw), so for a toddler that wouldn't be as ideal but for an older child would be great. five | Having three kids, I have tried just about every sleep sack and swaddle that exists on the market. I recently discovered Nested Bean and wanted to try theirs for Adaline. 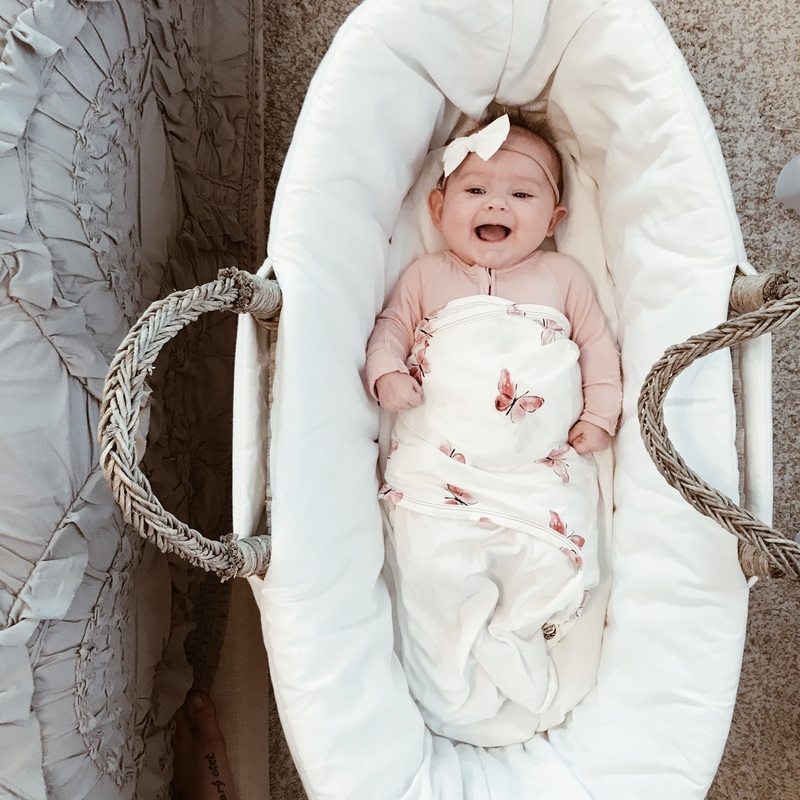 Nested Bean is most known for their Zen Swaddle, which is created with a lightly weighted pad (in the shape of a bean, hence the name) that sits on a baby's chest (as well as one on each side) to simulate the gentle pressure from a mother's touch. Each swaddle is created to last from birth to approximately 6 months, with their "2 sizes in 1 design" concept. What I love about this swaddle personally is that it can be used with a baby's arms in or out. From birth Adaline has always wanted her hands by her face so swaddling her body but leaving her arms out gives her the best rest. The Zen Swaddle is made of incredibly soft bamboo that is naturally thermal regulating and moisture wicking. So far she has loved hers and I was thrilled to discover a new product that kept her comfortable and feeling secure as she sleeps! Enter BLESSEDNEST15 at checkout for 15% off your total purchase from Nested Bean now through the end of April. seven | Speaking of bedding, we are doing some rearranging of rooms this month as we prepare to move Adaline out of our bedroom and into her own room (which is Olivia's current room). Olivia will then be sharing a room with Poppy, which she is so excited about. I have been keeping my eyes open for fun, matching bedding for the girls once we move Poppy to her twin bed in the Fall and I love these polka dot quilts from The Land of Nod. We have this polka dot sheet set on Olivia's bed, which I love, so I definitely plan to order a set for Poppy's bed to match. I'm thinking Penelope's bed, sheets and quilt will be her main gift when she turns 2 in the Fall, as a way to give her something special but still keeping it practical. I fully intend to stay in complete denial that she will be 2 in a few months until that day is actually here. eight | Dustin and I host a lot of parties, get togethers, a married couples small group, etc. in our home and always seem to be entertaining in some form or another. I love finding inexpensive pieces that make hosting a breeze. This glass drink dispenser is one we've had for years and love it so much, I recently bought a second one so we are able to serve both fruit infused ice water (I almost always just do lemons but sometimes lemon + limes, mint, or orange slices) and then homemade punch or lemonade alongside it. nine | Now that the weather is warming up and we are getting outside more, our favorite thing to bring along on our adventures is our gathre mat. If you haven't heard of them, they are beautiful bonded leather playmats that are perfect for the park, beach, picnics, indoor arts and crafts, and more. We have a maxi circle one (pictured above in a photo from July 2016) that we LOVE and recently added a medium-sized mat to our collection in their new Rylee + Cru Floral pattern. Gathre mats come in 4 different sizes, make great gifts for new parents and have so many uses. Plus the soft leather makes something simple like a picnic in the park seem extra special. ten | Last but not least, an up and coming new brand, Clementine Kids, is releasing their Spring line this Thursday April 20 and you guys, it is so good. Haley was so sweet to offer to send the girls a few of our favorite quilts. We love them all, but especially the Clementine quilt and the Huckleberry quilt, which has the most darling navy plaid pattern on the back -- perfect for summer picnics. I just recently discovered Clementine Kids and fell in love immediately -- the quilts are so cozy and the patterns couldn't be more perfect. I know you all will love them as much as we do! I hope your April has been wonderful so far! I have a fun girls night out coming up next week and we are in full party-planning mode over here for Olivia's 4th birthday party in May, I can't wait to share the theme soon! 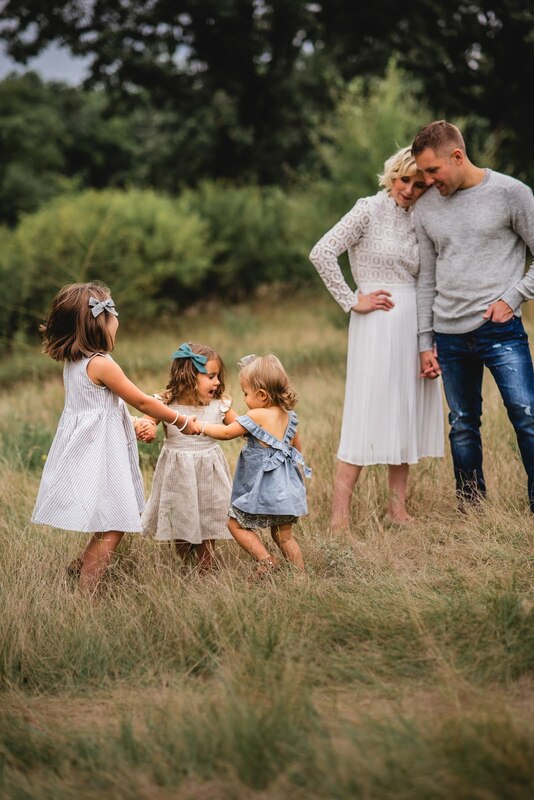 It seems like May is one of our busiest -- and best -- months of the year, with Spring photos, Mother's Day, Adaline's dedication, Olivia's birthday, Memorial Day and more. It's when the weather really starts warming, flowers start blooming and we spend more time outside than in with our 3 little girls. Happy Monday!